Last time, we found a simple utility function that reasonably approximates realistic levels of risk aversion. Now, we'll wrap up the series by incorporating the effects of U.S. taxes, which will result in our final, ready-to-use, practical utility function. 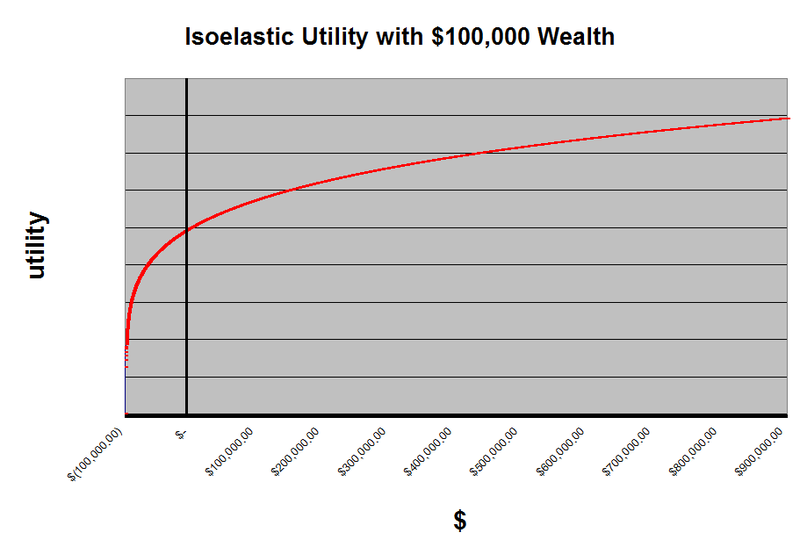 While traditional expected utility analyses are implicitly made on an ongoing basis, with no particular regard to the flow of time, U.S. taxes are paid based on yearly income and will require us to change our focus to year-by-year realizations of wealth. Accordingly, we can shift our utility function to account for our preexisting wealth and focus on the change in wealth that occurs during the upcoming year. 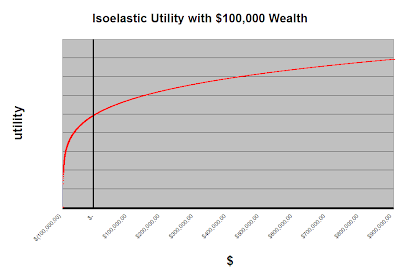 So, in order to define utility on the change in our wealth in the upcoming year, we shift the original utility function to the left by our net worth at the end of the prior year. The results, of course, will always be the same regardless of any shift. This is just a change in methodology, but it allows us to introduce a tax function which operates on each year's income. This approach offers some other benefits. The shifted utility function captures our preferences for different yearly salaries (perhaps useful when comparing different non-random job opportunities) just as well as it captures our preferences for risky year-long opportunities. Also, annnualized poker returns are more easily compared to alternatives in traditional investments such as stocks and bonds. Now that our utility function is defined over an entire year's results, we need to be careful about how we use this function throughout the year to evaluate risky opportunities we come across. It will be necessary to incorporate both year-to-date results and future plans. 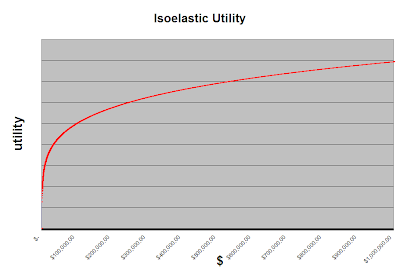 Xpast = $5,000; our year-to-date earnings are constant. Xpresent is a random variable representing the opportunity we are facing, taking value +$1,000 with probability 0.55 and -$1,000 with probability 0.45. Xfuture is a random variable representing all possible outcomes of our future results after this coin flip, from June 1st through December 31st of this year. This includes our usual "daily grind" along with probabilistically accounting for other opportunities we may encounter (such as this special coin flip). In particular, this approach allows our within-year risk tolerances to change during the year. 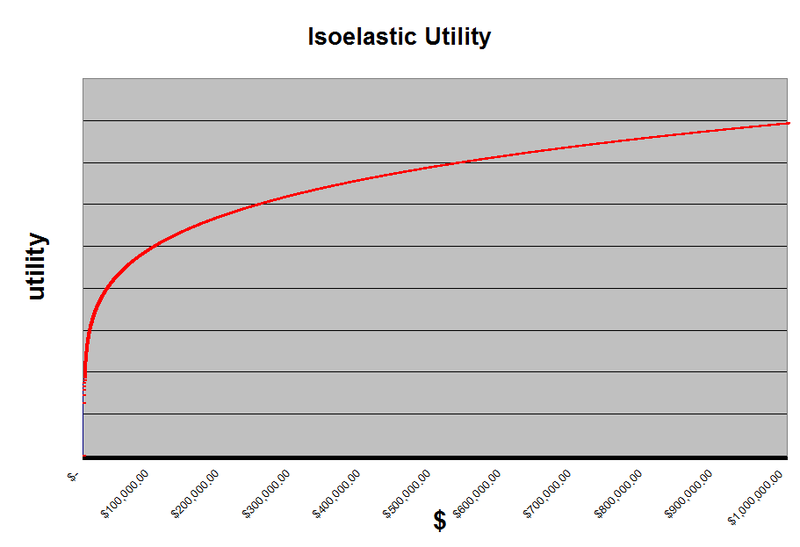 For example, on January 1st, for our given level of wealth and our projections of our winrates and volatility across different games, it might be the case that we maximize our expected utility by planning to play $1/$2 for the entire year. But then if we happen to run well or poorly in the beginning of the year, even if our risk tolerance hasn't changed, a reexamination of our utility function could cause us to move up or down to $2/$4 or $0.50/$1 during the year based on our year-to-date results. Therefore, despite the fact that we are now defining our utility function on an entire year's results, we are still able to use this function throughout the year to make rational individual decisions while conditioning on the year-to-date results we have realized. Now we're ready to consider the effects of U.S. income taxes. Everybody's tax situation is different, and you should make the necessary changes to the tax brackets in your own analyses, but here we assume that the taxpayer is single and subject to New Jersey state income tax in additional to federal income tax. We assume that the player is a hobbyist poker player, rather than a professional poker player, though filing as a professional poker player would not change this method by much; The professional poker player must pay an additional percentage of his income in self-employment tax, but this percentage is a flat rate across all levels of income, so it will not impact any expected utility decisions except possibly those that risk causing negative yearly earnings. We also assume that all negative effects of artificially-high Adjusted Gross Income (the sum of all winning sessions, prior to deducting all losing sessions) for non-professional poker players are ignored. This is a big assumption — there are several ways that this "phantom income" can cause at least a little bit of extra tax to be owed, but that's a story for another article. These effects are simply too complicated to capture in a simple model. Attempting to track these would also require that our utility function be defined on the sum of individual winning sessions as well as the sum of individual losing sessions, rather than just the net. 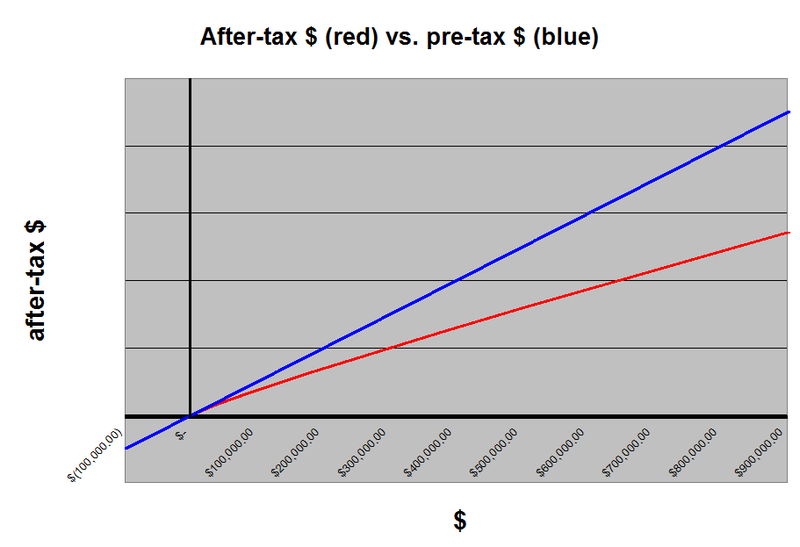 As expected, the difference between pre-tax and after-tax dollars becomes larger at higher income levels. Notice that this after-tax function satisfies the usual properties of utility functions: it is increasing, continuous, and nonincreasing in slope. Since U.S. tax rates are progressive, the slope becomes lower at higher levels of income. Also notice that, for negative yearly earnings, the pre-tax and after-tax earnings agree; poker players of either filing status get no deduction or carryover for losing years. 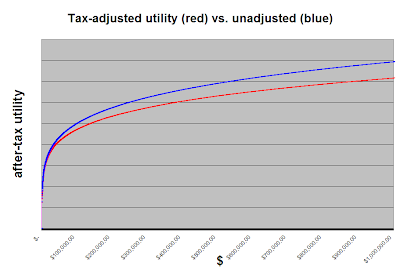 This final tax-adjusted utility function (plotted in red below against g, with s=0) effectively adds additional risk aversion to our original isoelastic utility function. 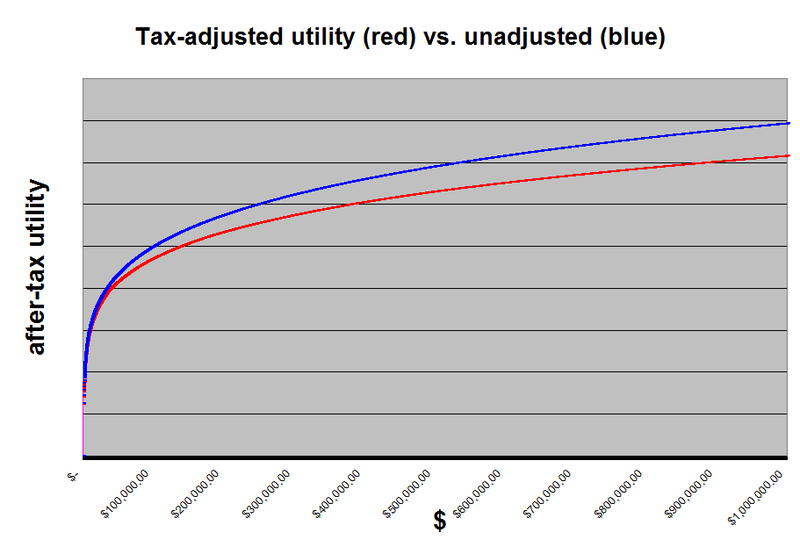 Compare it to the non-tax-adjusted utility function from earlier (blue) and notice that there is additional concavity. 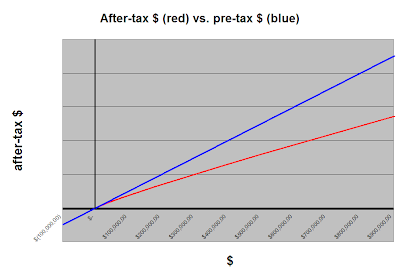 Since the tax function is piecewise-linear, taxes will induce no additional risk aversion for risks that cannot move us out of the tax bracket we would otherwise be in. However, for any risky opportunity that could move us up or down into a new tax bracket, the progressive nature of the tax rates will always create some additional risk aversion. Progressive income tax creates additional risk aversion when there is any probability of risky opportunities moving an individual into a higher or lower tax bracket. So, finally, we've got our utility function. It no longer has nice analytical mathematical properties, but is still easy to evaluate numerically. Now we can move on to tackling interesting practical problems such as those mentioned at the end of part 1.